Documetation about Plone's advanced workflow component. Workflow fits into one of the core themes of content management, which is the separation of logic, content, and presentation. Workflow is a chain of actions or events that occurs on something to complete a task and achieve an objective. 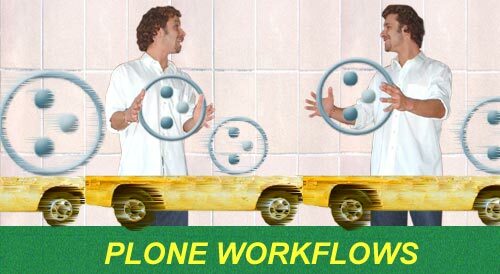 One of Plone's many strengths is its advanced workflow component. Workflow fits into one of the core themes of content management, which is the separation of logic, content, and presentation. Workflow is a chain of actions or events that occurs on something to complete a task and achieve an objective.This is a well-defined graph of how content moves through a publishing process. With Plone Workflow you can control who can see a content, modify it, create new content or see the contents of the given folder. Plone Workflow allows to define review process for certain content objects, giving various groups of users different levels of access to those objects, depending on where the object is in the review process. A good workflow shows that the software understands how real people do their job. It supports the fact the even simple jobs, like publishing a document, involves a group of people that have different roles and responsibilities. state - is a set of permission for each members role for a given content object. At any one time, content is in one of the states in the workflow. In each stage, different groups of users might have the right to view, edit, and delete an object. For example, page in a private state can only be viewed by its owner. The same page in published state can already be viewed by anyone. transition - is a way to change state of an object, e.g. submitting an object means to change its state from private to pending. The default Plone workflow has just 3 states and involves 2 roles. A documents starts out as private. The owner of the document submits the document for publication, changing its state to pending review. In case he then decides to perform additional edits to this document, he can change its state by pressing retract, and he document will again be in private state. After the document was submitted for publication and a user with the reviewer role logs in, all the documents that are pending appears on his review list. The reviewer can then either send them back to the document author for future re-writing (in case it require more finetuting etc. ), which moves it back to the private state, or publish the document, which leaves it in the published state. Since different sites require different types of workflow and access, Plone allows easy workflow modification and customization. Plone has several workflows added in default Plone Types configuration (Site Setup -> Types). Apart from number of available workflows, you will find bunch of ther useful settings, such as: visibility and versioning settings for content types. If your site requires additional custom workflow states, permissions or user roles - Quintagroup can implement those to your Plone project. We can modify existing workflow to make it meet your needs, as well as create completely new workflow to implement collaborative editing to your site. Contact us today for more information.